The Bronte Way is a 43 mile long distance footpath which starts at Oakwell Hall (“Fieldhead” in Charlotte Bronte’s novel “Shirley”) near Birstall in Kirklees near Bradford, and ends at Gawthorpe Hall in Padiham near Burnley. The route winds past many places of interest to Bronte enthusiasts, including the Bronte Birthplace in Thornton, Ponden Hall (“Thrushcross Grange” in Emily Bronte’s novel “Wuthering Heights”), Wycoller, and of course, the village of Haworth itself. The Bronte Way is a 43 mile long distance footpath which starts at Oakwell Hall ("Fieldhead" in Charlotte Bronte's novel "Shirley") near Birstall in Kirklees near Bradford, and ends at Gawthorpe Hall in Padiham near Burnley. A challenging walk which has moorland scenery, heritage and literary aspects. The route winds past many places of interest to Bronte enthusiasts, including the Bronte Birthplace in Thornton, Ponden Hall ("Thrushcross Grange" in Emily Bronte's novel "Wuthering Heights"), Wycoller, and of course, the village of Haworth itself. Scenic highlights include Penistone Hill country park, perched on the moors high above Haworth, the trail to the Bronte Waterfall and on over the Bronte Bridge up to Top Withens (a favourite walk of the Brontes themselves - Top Withens being suggested as the contentious setting for the Earnshaw farmstead in "Wuthering Heights"), and Wycoller in the Forest of Trawden at the edge of Pendle Witch Country. 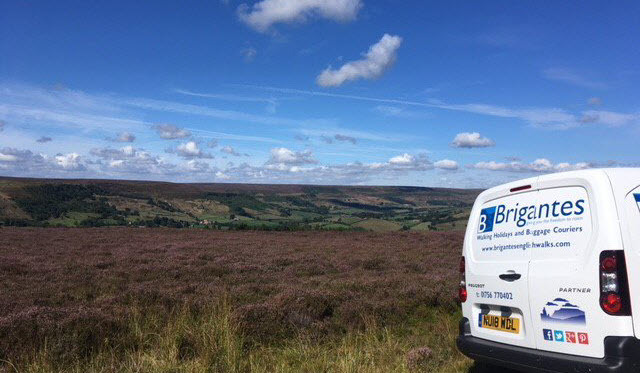 While some of the Bronte Way crosses wild and desolate moorland, civilisation is never far away and there are plenty of pubs and country houses to stop off for a quick pint of ale en-route. Places which can be visited along the route include Oakwell Hall (starting point) in Kirklees, Clayton village, Thornton village (including the Bronte Birthplace), Haworth village (including the Bronte Parsonage), The Bronte Waterfall, The Bronte Chair, The Bronte Bridge, Ponden Hall, Top Withens, Wycoller, Gawthorpe Hall (finishing point) near Burnley.